Download the PDF version of this Issue Brief. Also, watch our video on Proposition 6. Proposition 6, which will appear on the November 6, 2018 statewide ballot, would eliminate taxes and fees that California enacted in 2017 to fund transportation infrastructure and also would amend the state Constitution to require voter approval of any future fuel and vehicle-related tax and fee increases. Eliminating the new revenues enacted in 2017 would result in the loss of $5.1 billion annually for transportation infrastructure. Requiring voters to approve increases in fuel and vehicle-related taxes and fees would make it more difficult to fund transportation improvements. Moreover, any future increases in transportation funding could come at the expense of other vital public systems and supports, such as education, public safety, and health and human services. Prop. 6 qualified for the ballot with key support from members of California’s Republican congressional delegation; Republican gubernatorial candidate John Cox; and Carl DeMaio, chairman of Reform California. This Issue Brief provides an overview of the measure, discusses what it would mean for transportation and other public services, and examines other policy issues the measure raises in order to help voters reach an informed decision. Eliminate recently enacted funding for roads, highways, and public transportation. Prop. 6 would reduce funding for highway and road maintenance/repair and transit programs by more than $5 billion annually by eliminating the fuel and vehicle-related taxes and fees established by SB 1. Require the Legislature to obtain voter approval of fuel and vehicle-related taxes. Prop. 6 would amend the California Constitution to require the Legislature to obtain voter approval of new or increased taxes on the sale, storage, use, or consumption of gasoline or diesel fuel, as well as for taxes paid for the privilege of operating a vehicle on public highways. The Legislative Analyst’s Office (LAO) notes that requiring voter approval would make it more difficult to enact fuel and vehicle-related taxes, potentially resulting in less revenue for transportation purposes in the future. The amount by which revenues would be reduced is unknown, as it would depend upon future actions of the Legislature and voters. What Did Last Year’s Transportation Package (SB 1) Do? Governor Brown and the Legislature enacted SB 1, the Road Repair and Accountability Act of 2017, in April 2017, allocating more than $5 billion per year for transportation infrastructure improvements. This transportation package provides funding for highway and road maintenance and rehabilitation, public transit, and projects to improve conditions for pedestrians and bicyclists as well as to facilitate the movement of goods. The revenue comes from both higher fuel taxes and new vehicle-related fees, with a key component being the increase to the state’s base excise tax on gasoline (the “gas tax”). Prior to being raised in 2017, this tax had been frozen since 1994, with the result that revenues from the gas tax were unable to keep up with demands for transportation improvements. $2.5 billion per year from increased state taxes on gasoline, primarily from a 12-cent per gallon increase in the state’s base gas tax, which took effect on November 1, 2017. $1 billion per year from a 20-cent increase in the state’s excise tax on diesel fuel and a 4 percentage point increase in the diesel fuel sales tax, both of which took effect on November 1, 2017. $1.7 billion per year from a new annual transportation improvement fee, which took effect on January 1, 2018. This fee ranges from $25 to $175 per vehicle based on the value of the vehicle. For instance, a vehicle valued at less than $5,000 would incur a fee of $25, while a vehicle valued at $60,000 or more would incur a $175 fee. $19 million per year from a new annual fee of $100 on all zero-emission vehicles starting on July 1, 2020. These taxes and fees will be annually adjusted for inflation to prevent them from losing value over time. The transportation improvement fee will be adjusted starting on January 1, 2020; the gas and diesel fuel excise taxes will be adjusted starting on July 1, 2020; and the zero-emission vehicle fee will be adjusted starting on January 1, 2021. SB 1’s initial allocations are already reflected in the state budget. For example, in its first (partial) year of implementation, the state budget for 2017-18 (the fiscal year that ended on June 30, 2018) allocated over $2.8 billion for SB 1 transportation improvements, with half going to state projects and half to local projects. The 2018-19 state budget allocates $4.6 billion for SB 1 transportation improvements, with half going to state projects and half to local projects. By 2020, when all of SB 1’s taxes and fees are fully in effect and the inflation adjustments begin, the state expects the annual allocation to be $5.1 billion, split evenly between state and local projects. $1.9 billion per year for state highway and bridge repairs. $1.8 billion per year for local road repairs. $750 million per year for public transit and intercity rail. $310 million per year to improve trade corridors. $250 million per year to reduce congestion on major commute corridors. $100 million per year for bicycle and pedestrian projects to better link travelers to transit facilities. $170 million per year for a range of smaller programs, including freeway service patrols, local planning grants, university transportation research, and parks and agricultural programs. What Would Passage of Proposition 6 Mean for Transportation and Other Public Services? Reduced funding for road, highway, and transit improvements. In the current state fiscal year (2018-19), Prop. 6 would eliminate $2.4 billion in transportation funding. By 2020-21, Prop. 6 would mean a reduction of $5.1 billion annually in funding for road and transit improvements. Decreased ability to raise state revenues for transportation infrastructure in the future. Prop. 6 would require the Legislature to obtain voter approval for all future increases in fuel and vehicle-related taxes and fees. While the actual revenue impact of this provision would depend on future legislative actions and the will of California voters, requiring voter approval would undoubtedly make it harder to raise revenues for transportation infrastructure. Increased pressure on state and local budgets to finance future public transportation improvements. The combination of reducing state funds for transportation infrastructure and making it more difficult to raise revenues for transportation projects in the future would put the state, as well as local governments, under increasing pressure to fund future transportation investments from their general funds, from which they must also pay for an array of other vital public systems and supports. Demands for transportation investments would, as a result, compete with needed investments in education, public safety, housing, and health and human services. Reduced ability to keep up with critical public transportation needs in the future and reduced safety levels. The increased difficulty of raising dedicated state revenues for transportation, coupled with competition for state and local general fund support, would make it harder for state and local governments to keep up with the demand for transportation improvements in the future. California’s state and local governments already confront a large backlog of deferred maintenance (see more on this topic in the next section). The costs of maintenance and repairs rise the longer they are deferred due to increasing decay and the likelihood that facilities may need to be fully replaced. Putting off maintenance and repairs also increases the safety risk of the state’s transportation facilities — roads, highways, bridges, and transit facilities. Fewer jobs and slower economic growth. Reduced transportation funding would mean fewer jobs and less economic activity in communities across California. The state estimates that there are more than 4,000 local transportation projects already receiving SB 1 funding, including projects in every county in the state. Those projects generate jobs and economic activity. For instance, the White House Council of Economic Advisors has estimated that every $1 billion in highway and transit investment supports 13,000 jobs. Does California Need Additional Funding for Transportation? Approximately $35 billion is spent each year on transportation in California, including $16 billion from local sources, $12 billion from state sources, and $7 billion from federal sources. Local sources come from local sales taxes (which are closely restricted by state law), transit fares, and local government general funds that must also fund other vital programs and services such as public safety, housing, and health and human services. Federal funding primarily comes from federal fuel taxes, including the federal excise tax on gasoline. The federal gas tax is not automatically adjusted for inflation each year to account for the rising costs of goods and services. This means that Congress and the President must agree to raise the federal gas tax rate. However, federal policymakers have not increased this rate since 1993, leaving the federal Highway Trust Fund (the primary source of federal funding for state and local transportation) unable to keep pace with demands for new facilities or for maintaining and repairing existing highways, roads, bridges, and other facilities. State transportation funding primarily comes from fuel taxes and vehicle-related fees. 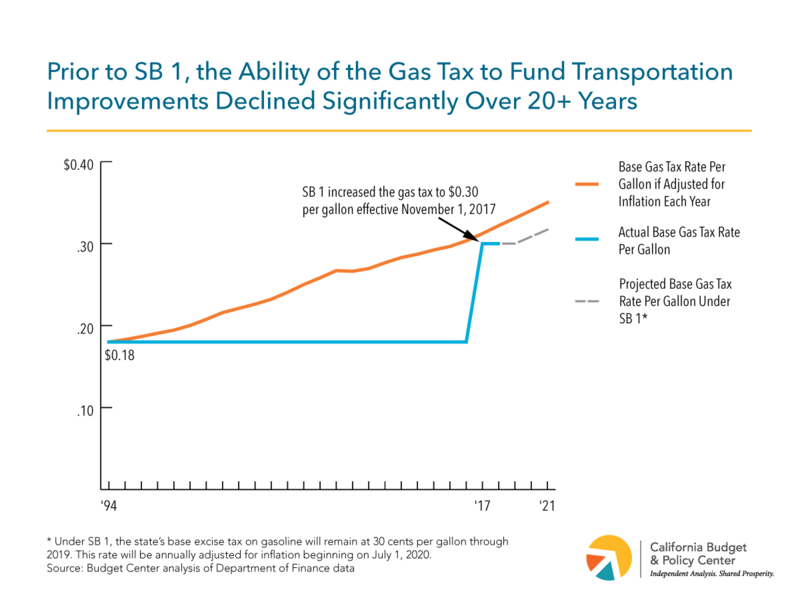 Until the passage of SB 1, California had not increased its gas tax rate since 1994, leaving the state unable to keep up with demands for transportation improvements. As a result, California has faced a significant deficit in transportation funding to pay for infrastructure improvements and deferred maintenance — a deficit that has been exacerbated by inadequate federal funding. In its 2017 “Infrastructure Report Card” assessing the state of the nation’s infrastructure, the American Society of Civil Engineers estimated that 50% of California’s public roads are in poor condition, that 5.5% (1,388) of the state’s bridges are structurally deficient, and that Californians pay $844 per driver annually for the costs of driving on poorly maintained roads. As recently as the 2016-17 state budget, Governor Brown’s Administration estimated that California confronts $57 billion in total deferred maintenance needs related to transportation. The SB 1 transportation package aims to address the state’s transportation infrastructure needs by providing more than $5 billion in additional annual funding. As noted above, about half of this funding comes from the increase to the state’s base gas tax rate, which had been frozen since 1994. If the 1994 rate ($0.18 per gallon) had been adjusted each year to account for changes in the cost of living, it would have risen to $0.32 per gallon by 2018 — slightly higher than the current rate of $0.30 per gallon established by SB 1 (see chart below). In other words, SB 1 nearly restores the purchasing power of the gas tax to fund transportation improvements. Moreover, by annually adjusting all of the fuel and vehicle-related taxes and fees for inflation, SB 1 ensures that the state’s sources of funding for transportation infrastructure will be better able to keep up with future needs. Is the Gas Tax a Fair Tax? Whenever increases in the gas tax are considered, questions are raised about the fairness of the tax. There are different ways to assess the fairness of taxes, but most people agree that a fair tax system asks taxpayers to contribute to the cost of public services based on their ability to pay. When lower-income households spend a larger share of their budgets on taxes, such as for transportation, than do higher-income households, those taxes are considered to be regressive. Conversely, taxes that impose a relatively greater cost on higher-income households are considered to be progressive. In this respect, gas taxes are often thought to be regressive because all households pay the same rate regardless of their income. However, it is important to put the gas tax in the broader context of overall funding for the transportation package. State leaders structured the transportation improvement fee on vehicles — another key piece of the package’s revenue mix — so that it is based more on people’s ability to pay, with the fee increasing relative to the value of the vehicle. Moreover, the critique that the gas tax has a greater impact on low-income households would be more concerning if this tax were chosen over other, more progressive ways of funding these improvements. The reality is that transportation funding in California, and nationally, as outlined above, primarily relies on a set of usage-based excise taxes and fees — taxes and fees that households and businesses pay to use highways, roads, transit facilities, ports, airports, and so on. While usage-based taxes and fees may be mostly regressive, they can be considered fair, to a degree, in that they are paid as the cost of using the service. Even alternative transportation funding options — toll roads and fees based on vehicle miles traveled, for instance — raise revenues based on people’s use of highways and roads, and not with regard to users’ incomes. Another potential alternative, the carbon tax — a tax imposed on the burning of carbon-based fuels such as coal, oil, and gas — would still generate revenues based on the demand for, and use of, those fuels. Another option would be to fund transportation improvements from the state’s General Fund, or through general obligation (GO) bonds where the service on the debt is paid out of the General Fund, because most state General Fund revenues come from California’s progressive income tax. However, as noted above, relying on the state General Fund would put transportation investments in competition with other vital public systems and supports for limited state funding. Usage-based taxes and fees also make sense as a source of transportation funding because they can be structured in ways that meet other policy goals. For instance, because driving creates emissions that harm the environment, taxes and fees can be designed to encourage transit use and alternative forms of transportation. Concerns about how particular taxes affect lower-income individuals can be addressed by providing offsets. For instance, California could expand its state Earned Income Tax Credit (the CalEITC) — a refundable credit for low-income working Californians — as a means of offsetting increased gas costs. The Institute for Taxation and Economic Policy recommends that states modernize their gas taxes by increasing gas tax rates to reverse long-term declines (relative to inflation), structuring gas taxes so that their rates keep up with rising costs, and creating or enhancing tax credits, like the EITC, for low-income families to offset the impact of gas tax increases. Are SB 1 Revenues Required to Be Spent on Transportation Improvements? One of the questions raised about the SB 1 transportation package is whether the funds are assured to go toward transportation improvements. In fact, SB 1 dedicates approximately two-thirds of its revenues to highway and road repairs and the remainder to other transportation improvements, such as public transit, according to the LAO. In addition, the SB 1 transportation funding package included a set of accountability provisions designed to ensure that the revenues are spent as intended. Among these was a constitutional amendment on the June 2018 statewide ballot (Prop. 69, approved by 4 in 5 voters) that prevents SB 1 funds from being used for anything other than specified transportation purposes. Prop. 6 would eliminate recently enacted funding for transportation infrastructure by repealing certain fuel and vehicle-related taxes and fees. The measure would also amend the state Constitution to require the Legislature to obtain voter approval of any future increases in fuel and vehicle-related taxes and fees. The fiscal impact of Prop. 6 would be to eliminate $5.1 billion in annual revenues used to fund highway and road maintenance and repairs, transit, and other transportation programs. Requiring voters to approve future fuel and vehicle-related taxes and fees would make it more difficult to fund transportation infrastructure improvements in the future. Prop. 6 presents California voters with a choice as to whether they are willing to support continued investments in California’s transportation infrastructure. Approving Prop. 6 would undo recent increases in fuel and vehicle-related taxes and fees and significantly decrease funding available for transportation infrastructure. Rejecting Prop. 6 would allow California to continue to invest in highways, roads, bridges, transit, and other transportation improvements. Secretary of State’s Office, California General Election Tuesday November 6, 2018: Text of Proposed Laws, downloaded from https://vig.cdn.sos.ca.gov/2018/general/pdf/topl.pdf on August 21, 2018. See also Legislative Analyst’s Office, “Proposition 6: Eliminates Certain Road Repair and Transportation Funding. Requires Certain Fuel Taxes and Vehicle Fees Be Approved by the Electorate. Initiative Constitutional Amendment. Analysis by the Legislative Analyst,” in Secretary of State’s Office, California General Election Tuesday November 6, 2018: Official Voter Information Guide, p. 40. Legislative Analyst’s Office, “Proposition 6: Eliminates Certain Road Repair and Transportation Funding. Requires Certain Fuel Taxes and Vehicle Fees Be Approved by the Electorate. Initiative Constitutional Amendment. Analysis by the Legislative Analyst,” in Secretary of State’s Office, California General Election Tuesday November 6, 2018: Official Voter Information Guide, p. 41. For an overview of SB 1, see Legislative Analyst’s Office, Overview of the 2017 Transportation Funding Package (June 2017). In addition to the “base” excise tax, the state has a separate excise tax on gasoline known as the “swap” excise tax. For a description of the swap excise tax, see Legislative Analyst’s Office, Overview of the 2017 Transportation Funding Package (June 2017), pp. 2-3. Department of Finance, California State Budget 2018-19 (June 2018), p. 84, downloaded from http://www.ebudget.ca.gov/2018-19/pdf/Enacted/BudgetSummary/FullBudgetSummary.pdf on August 21, 2018. For an overview of how SB 1 funding is generated and allocated, see the Legislative Analyst’s Office, Overview of the 2017 Transportation Funding Package (June 2017). Legislative Analyst’s Office, Overview of the 2017 Transportation Funding Package (June 2017), p. 1. Department of Finance, California State Budget 2018-19 (June 2018), p. 81, downloaded from http://www.ebudget.ca.gov/2018-19/pdf/Enacted/BudgetSummary/FullBudgetSummary.pdf on August 21, 2018. For a discussion of transportation infrastructure funding in California see Legislative Analyst’s Office, “Proposition 6: Eliminates Certain Road Repair and Transportation Funding. Requires Certain Fuel Taxes and Vehicle Fees Be Approved by the Electorate. Initiative Constitutional Amendment. Analysis by the Legislative Analyst,” in Secretary of State’s Office, California General Election Tuesday November 6, 2018: Official Voter Information Guide, p. 40. Department of Finance, California State Budget 2018-19 (June 2018), p. 82, downloaded from http://www.ebudget.ca.gov/2018-19/pdf/Enacted/BudgetSummary/FullBudgetSummary.pdf on August 21, 2018. Department of Finance, California State Budget 2018-19 (June 2018), pp. 82-83, downloaded from http://www.ebudget.ca.gov/2018-19/pdf/Enacted/BudgetSummary/FullBudgetSummary.pdf on August 21, 2018. American Society of Civil Engineers, 2017 Infrastructure Report Card: Infrastructure in California, downloaded from https://www.infrastructurereportcard.org/state-item/california/ on August 21, 2018. For a discussion of California’s deferred maintenance see Legislative Analyst’s Office, The 2016-17 Budget: Governor’s General Fund Deferred Maintenance Proposal (February 12, 2016), p. 2. For a discussion of California’s tax system, including state and local sales taxes and other sources of revenue, see Jean Ross, Alissa Anderson, and Samar Lichtenstein, Principles and Policy: A Guide to California’s Tax System (California Budget & Policy Center: April 2013). For an overview of California’s EITC see Alissa Anderson, How Much Do Working Families and Individuals Benefit From the CalEITC? (California Budget & Policy Center: February 2018). Institute for Taxation and Economic Policy, Building a Better Gas Tax: How to Fix One of State Government’s Least Sustainable Revenue Sources (December 2011). Legislative Analyst’s Office, “Proposition 6: Eliminates Certain Road Repair and Transportation Funding. Requires Certain Fuel Taxes and Vehicle Fees Be Approved by the Electorate. Initiative Constitutional Amendment. Analysis by the Legislative Analyst,” in Secretary of State’s Office, California General Election Tuesday November 6, 2018: Official Voter Information Guide, pp. 40-41. For an overview of the accountability provisions in SB 1 see Legislative Analyst’s Office, Overview of the 2017 Transportation Funding Package (June 2017), p. 6 and pp. 8-9. Proposition 69 was approved on June 5, 2018 (81% yes, 19% no). See Secretary of State’s Office, Statewide Direct Primary Election – Statement of the Vote, June 5, 2018: State Ballot Measures (Propositions 68-72) by County, downloaded from https://elections.cdn.sos.ca.gov/sov/2018-primary/sov/132-ballot-measures.pdf on August 22, 2018. “Argument in Favor of Proposition 6,” in Secretary of State’s Office, California General Election Tuesday November 6, 2018: Official Voter Information Guide, p. 42. See also “Rebuttal to Argument Against Proposition 6,” p. 43. “Argument Against Proposition 6,” in Secretary of State’s Office, California General Election Tuesday November 6, 2018: Official Voter Information Guide, p. 43. See also “Rebuttal to Argument in Favor of Proposition 6,” p. 42.